Gunny and Sharon have been through a lot together, coming out ( 1: Adjective ) in the end. Fate throws them a ( 2: Noun ), so to speak, in a mastiff by the name of Tank. Adopting a dog means taking on all that animal’s troubles, ( 3: Adjective ) or small. When the dog in question ( 4: Verb ending in s ) nearly three-feet at the shoulder and weighs more than ( 5: Number ) pounds? All the problems are big! Lane Robinson has always had a soft spot for dogs. All breeds and sizes; if it’s a furbaby, he’s a big pushover. Gunny loves his ( 6: Plural noun ). Persuaded into helping a Rebel member sort out a difficult situation, Gunny didn’t expect to find a new family member in the form of an enormous ( 7: Dog breed ). With a child on the way about to add more chaos to his life, he thought the big guy would be a temporary house guest. ( 8: Verb ) the monster-sized dog home, foster him for a little while, then place the critter with a loving family. Piece of ( 9: Noun ). But, when he came through for Sharon in an important way, helping her through a difficult time, Gunny decided the dog had found a forever home. Remember those big ( 10: Plural noun )? They’re about to get even bigger! This novella sits alongside Rebel Wayfarers MC book #10, Bones. 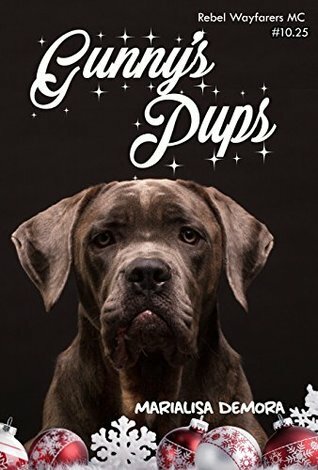 Now that your fun is through, here is the real blurb for Gunny's Pups by Marialisa Demora.